Formerly trained by Dale Romans, Birdatthewire, fresh off an upset win going seven furlongs in the Grade I La Brea Stakes on Dec. 26, heads a field of seven older fillies and mares going 1 1/16 miles in Saturday's Grade II, $200,000 La Canada Stakes at Santa Anita. Ridden by Mike Smith, Birdatthewire, who is now conditioned by Tom Proctor, rallied from far back to take the La Brea by a half length and is well suited to the stretch out, as she has two wins from four tries at a mile and a sixteenth. Although she has a penchant for “running out” in her races, Birdatthewire was full of run early in the La Brea and won easier than her margin of victory would indicate. Owned by Forum Racing, IV, Birdatthewire, who has four wins from 11 starts with earnings of $569,090, will be ridden for the first time by Drayden Van Dyke. Although he was impressed with Birdatthewire's effort in the La Brea, Smith will instead ride trainer Jim Cassidy's Yahilwa, who had been handled in her last four starts by the recently departed James Graham. Third, beaten a neck two starts back in the Grade I, 1 1/8 miles Spinster Stakes Oct. 4 at Keeneland, Yahilwa has been idle since running sixth in the Grade I Breeders' Cup Distaff on Oct. 30. Owned by Deron Pearson's D.P. Racing, LLC, Yahilwa, a 6-year-old mare by Medaglia d'Oro, is 31-6-5-5 overall with earnings of $519,495. Trainer Simon Callaghan's Taris, a facile winner of the Grade III, one mile Go For Wand Handicap Nov. 27 at Aqueduct, returns to her home base at Santa Anita Saturday and could pose an elusive target on the lead with Gary Stevens engaged to ride. Off at odds of 4-5 in New York, the 5-year-old mare by Flatter pressed the early pace and took command around the far turn under Joel Rosario. Ridden by Stevens to an impressive win four starts back in the Grade III, 6 ½ furlong Rancho Bernardo Handicap Aug. 16 at Del Mar, Taris could get early pressure from Tara's Tango or supplemental entrant, Illuminant, who has raced primarily on turf. 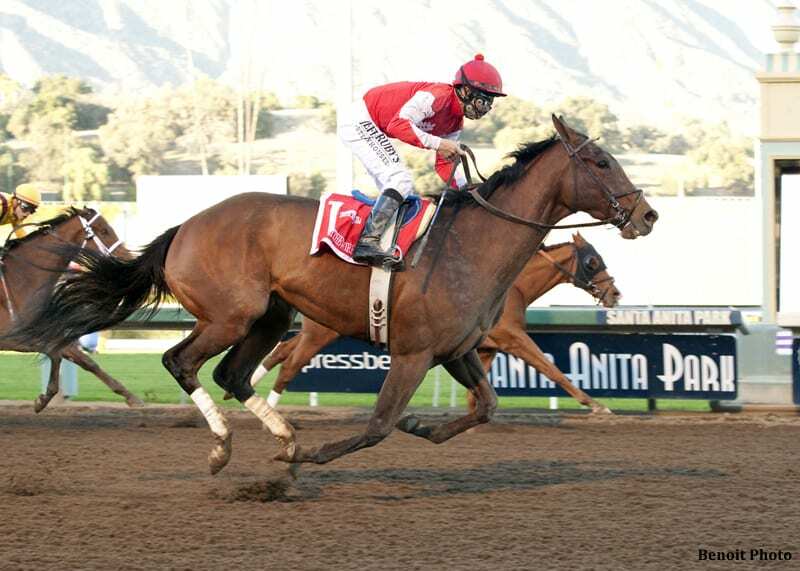 The complete field for the Grade II, $200,000 La Canada Stakes, to be run as the seventh race on a nine-race card Saturday, with jockey and weights in post position order: Tara's Tango, Martin Garcia, 118; Illuminant, Flavien Prat, 118; Oscar Party, Santiago Gonzalez, 118; Honey Ride, Tyler Baze, 118; Yahilwa, Mike Smith, 118; Birdatthewire, Drayden Van Dyke, 120, and Taris, Gary Stevens, 118. This entry was posted in Racing and tagged birdatthewire, drayden van dyke, Horse Racing, La Canada Stakes, mike smith, santa anita, taris, thoroughbred, Tom Proctor, yahilwa by Mike Willman/Santa Anita. Bookmark the permalink.